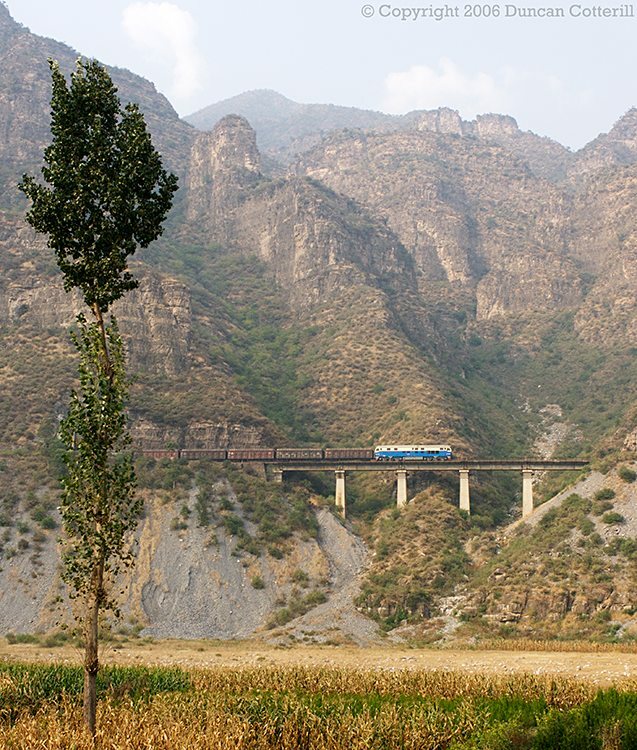 The line from Beijing to Taiyuan passes through some very difficult country around Shidu. The Juma River Valley, with its precipitous cliffs and meandering course, isn't the most obvious route for a railway and the civil engineering reflects this. The builders made liberal use of tunnels to shortcut most of the river's meanders and to avoid the need for galleries cut into sheer cliff faces. As a result, much of the line is actually underground. When the track is on the surface, it's usually only for a short distance on a viaduct before it dives into the next long tunnel. This view shows an unidentified DF4D on an eastbound coal train west of Pingyu on 1 October 2006 and gives an impression of the rugged terrain.